The 2017 Blancpain St. Valentine’s Day Special Edition. When it comes to fine watches, it sometimes seems like every day is Father’s Day. No need to create a special watch to celebrate men, since most mechanical timepieces are already geared to male aficionados. 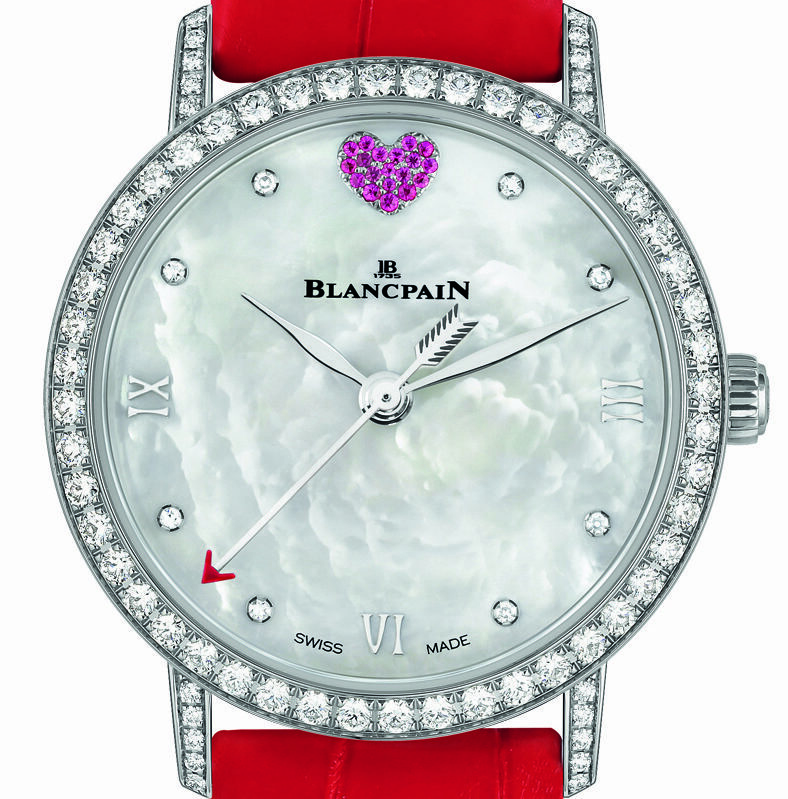 Blancpain, however, thoughtfully singles out women once a year for a special-edition watch designed to be gifted to a woman on St. Valentine’s Day. Blancpain, the maker of such tough-guy timepieces as the Fifty Fathoms and sophisticated complications like the Tourbillon Carrousel, has been making ladies watches since 1930, and lays claim to having made the first automatic watch for ladies. In addition to making ultra-slim movements for women, the company also makes a Quantième Retrograde with retrograde date and a Complete Calendar with moon phase. The movements used for the Blancpain St. Valentine’s Day watches are all mechanical – Blancpain has never made a quartz movement – most designed specifically for ladies’ watches. Since the Blancpain St. Valentine’s Day blancpain fifty fathoms bathyscaphe was first introduced in 2001, it has been powered by several different movements, most with center seconds hands, which is rare on a ladies’ mechanical timepiece. The calibers used in the past Blancpain St. Valentine’s Day watches include the ultra-thin automatic Caliber 1150 with 100-hour power reserve; Caliber 6763 automatic day-date, with pointer-type date display; Caliber F185, a flyback chronograph, originally used by the brand in 1998 to power the world’s first ladies’ flyback chronograph; the “Lady Bird” Caliber 6150, which at the time it was introduced (in the 1950s) was the world’s smallest automatic movement (15.7mm diameter). 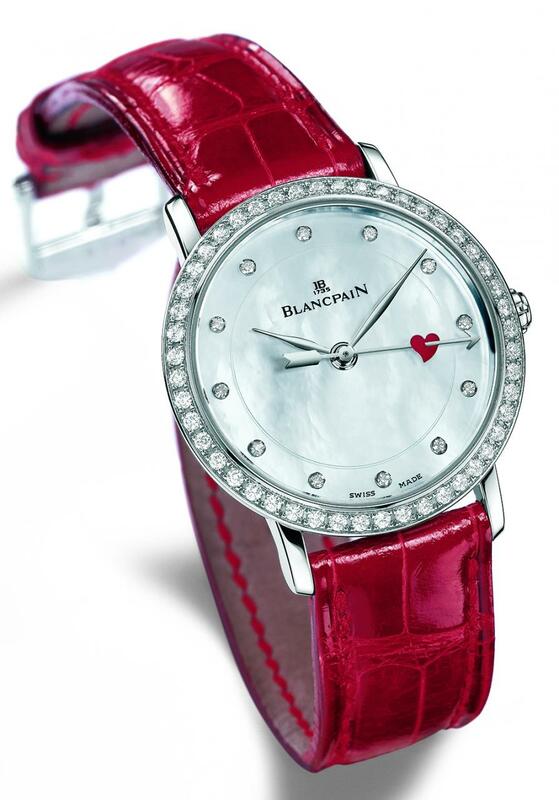 The 2003 version of the Blancpain St. Valentine’s Day Special Edition. 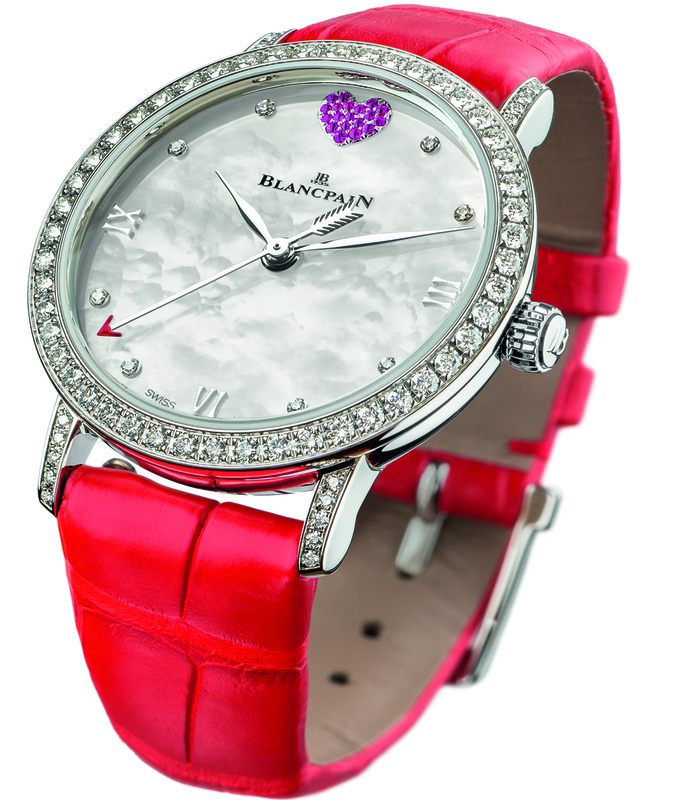 The 2004 version of the Blancpain St. Valentine’s Day Special Edition. 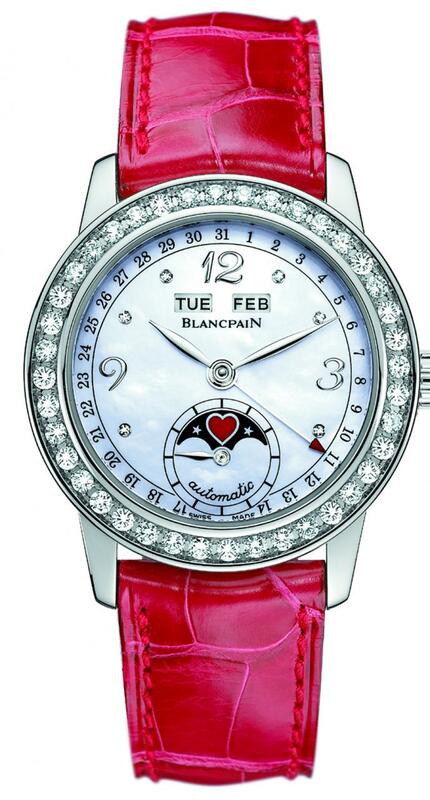 The Blancpain St. Valentine’s Day watch has been a tradition since 2001 and usually includes a heart motif placed artfully somewhere on the watch. This year, it is formed by a cluster of 19 rubies set into the dial at 12 o’clock. The rubies are buff-top cut, a mixed cut that typically has a smooth upper half and a faceted pavilion, a combination that creates light return even when a gem is set flush into metal – particularly when it is set into a thin layer of metal, such as a watch dial, where no light penetrates the pavilion. The heart has had several interesting incarnations on the special editions. In the 2007 piece, the inner mother-of-pearl dial was heart-shaped. In 2009 the small seconds subdial was outlined by rubies set to form a heart shape. On the 2011 version, a heart-shaped ruby was set discreetly at 12 o’clock flush with the diamonds on the bezel. 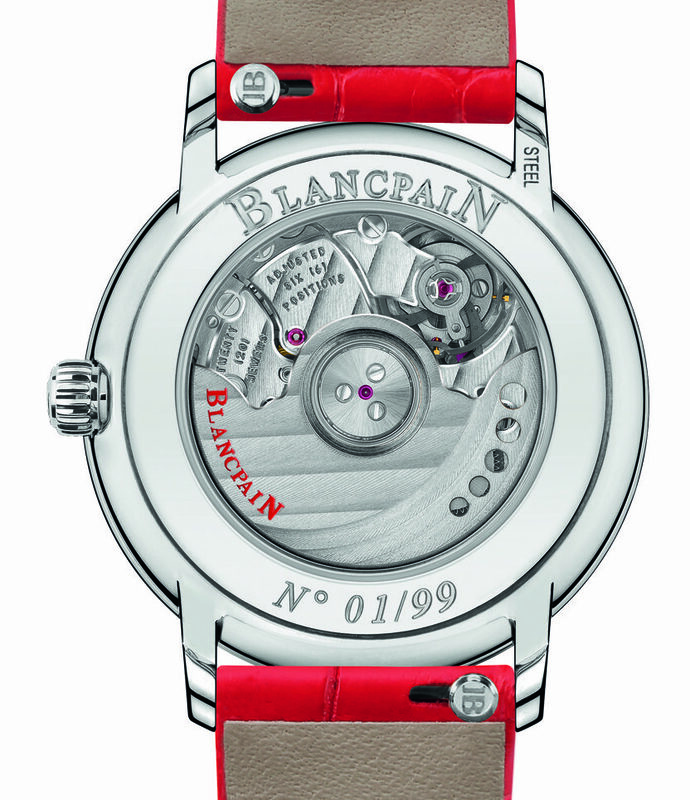 The dial of the 2013 edition featured five red-lacquered mother-of-pearl hearts, with the hearts repeated on the rotor and case side. A heart charm dangles from the strap of the 2016 edition. The 2017 version of the Blancpain St. Valentine’s Day Special Edition.